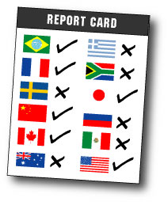 I first published the Web Globalization Report Card about 10 years ago. Since then, a number of companies have developed their own internal Report Cards (and I’ve assisted with several). As part of our World-Readiness program, we created a Globalization Report Card system to assess the degree of world-readiness in each Adobe product. This scorecard measures products against a set of internationalization criteria (ability to input international characters, display date formats, translate the user interface, and so on…). It is an efficient way to track progress made by each team over time and can even create some healthy competition among product teams. These teams are motivated to be on top of the i18n charts! Focus on achieving best practices: There’s nothing like putting your goals in writing — with buy-in from different teams (web, marketing, geo) — to focus everyone on a few key goals. Tracking progress: It’s easy during the course of a year to change direction, put out various fires, and generally lose track of where you were headed at the beginning of the year. The Report Card never lets you lose track of where you began and how far you’ve come. Educating colleagues: It’s safe to say that web globalization is a “black art” to many people in your company. But the Report Card provides an indirect means of educating them. What’s a “global gateway” they may ask? And when they ask you’re halfway towards convincing them on why you need to rework the home page. Or add languages. Or more local content. Quickly adapting to emerging trends: The Report Card is not written in stone. It’s designed to be updated regularly to keep companies ahead of the curve. Which means you’ll probably never get a perfect score. And that’s okay. Progress is more important than perfection. I know of a few companies that use Report Cards as part of their employee review process — and in these cases the reports are taken VERY seriously. Of course, a Report Card in itself doesn’t necessarily result in positive change. It’s just one tool and it has to be well used to have the desired effect. I have witnessed a few instances of employees asking to “opt out” of the Report Card simply because they didn’t “buy-in” to the metrics. But if you do get buy-in I believe you will see amazing results over the long haul. I’ve seen it happen again and again. In September at the Brand2Global Conference I will teach a half-day session on benchmarking global websites. More important, I’ll be working with participants to help them develop benchmarks for their company websites. This session is part of the Mastering Web Globalization course I’m teaching the day before the conference begins. Let me know if you have any questions.